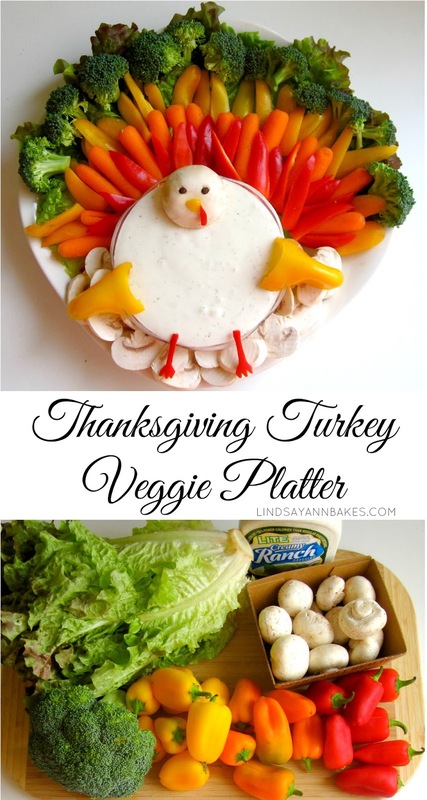 This veggie platter turkey is a perfect thanksgiving appetizer! Skip the boring crudite and opt for purposefully places veggies to create this adorable turkey out of veggies and ranch dip. To start, place some lettuce at the top of your plate and start slicing up your "feathers". I used a mushroom for the head and stuck 2 peppercorns in for eyes (you can also use black beans). The beak and gobble, wings and legs are all yellow and red bell pepper. Place a row of broccoli, followed by yellow bell pepper "feathers" a the top of the plate. Then add a row of baby carrot "feathers". Last, add a row of red bell pepper "feathers". Layer a row of sliced mushrooms in the empty space below the dip bowl and put wings and legs in place. Fill the bowl up with ranch dressing or veggie dip. Lastly, place the head at the top of the bowl. Fill a small bowl of ranch and place it toward the bottom of a round platter. Line the platter with lettuce leaves around the top of the bowl and mushroom slices around the bottom of the bowl. Layer a row of broccoli florets at the top of the lettuce, followed by yellow pepper slices, baby carrots, and red pepper slices. Use a mushroom for the head and stick 2 peppercorns in for eyes (you can also use black beans). Cut a beak and gobble, wings and legs form yellow and red bell pepper. Place the head gently at the top of the bowl of ranch dip. Rest the legs on the bowl and mushroom slices. If you have leftover veggies, this particular mix pairs wonderfully with some rice and teriyaki sauce!